Coreopsis major.Copyright © 2010 The Walthour-Moss Foundationwalthour-moss.org. (Accessed 5/2014). 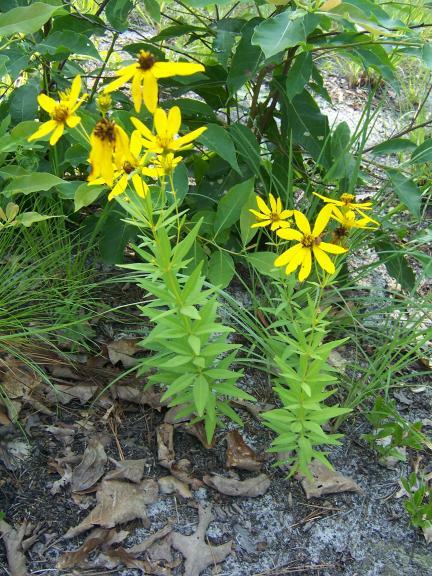 Coreopsis major is a perennial herb, 50-100 cm tall, from rhizomes but stems usually tufted, hairy. Leaves opposite, 3-parted, stalkless, leaflets 3-8 cm long, 1-3 cm wide, upper leaves sometime undivided. Flowers yellow, ray flowers 1-2.5 cm long, disk 0.7-1.5 cm wide, flowers yellow becoming red or purple, outer bracts of flower head base 8, bristly-hairy, to 0.3 cm long, inner bracts much wider and 2-3 times as long as outer; blooms July-Sept.
Fruit dry, 1-seeded achene 0.4-0.7 cm with a few bristles, sometimes awned.